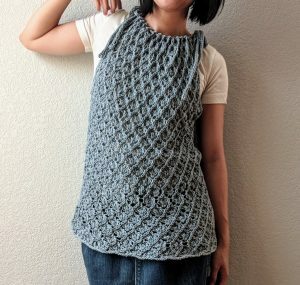 This is my first purchased pattern. 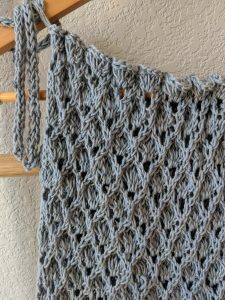 This pattern was from Universal Yarn. I tried to follow the pattern many times and I didn’t get it how it meant to be. So I changed the pattern on row 5. I moved the * to after k4. So instead of k1, *k4, [k2tog]twice, it’s k5,*[k2tog]twice. The rest of row 5 stayed as is. Row 6, I changed to p5, *p2tog-b, rest of row 6 stayed as is. Stitches I learned from this pattern: Mock Twist Stitch. 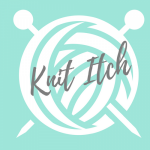 That’s how the infinite diagonal knit stitch appears. I don’t know if it was because the yarn I used was different than recommended. 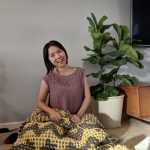 I only repeated the pattern stitch 11 times instead of 13 times and got to the recommended length. 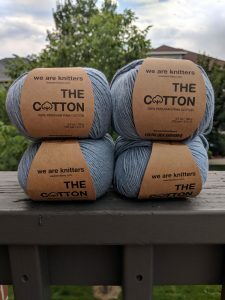 I bought four skeins of We Are Knitters cotton. I only used three skeins. 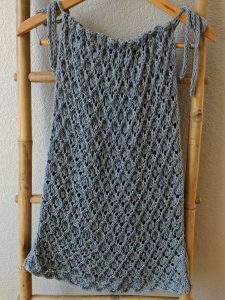 I was thinking maybe I could turn this into a dress with the fourth skein. There are too many projects waiting for me to finish. Maybe sometime in the future. I uploaded a video on how to make the I-cord with my interchangeable needles on YouTube. I was just about to go out to buy a pair of double sided needles and decided these would work as well.